In the aftermath of protests over police killings of black civilians, local officials and residents discussed a wide variety of topics that ranged from the improvement of police and community relations to broader social issues at a five-hour-long City Council meeting Saturday morning. Dozens of educators, community members and elected officials — along with a panel of experts, including Berkeley Technology Academy principal Sheila Quintana and Alameda County Supervisor Keith Carson — gathered to help propose solutions for concerns about police accountability and transparency. In addition to police-related matters, they discussed mental health and education reform to address racial issues. “If we want to be serious about making black lives matter, we’re going to get serious about changing the social-economic injustices that have impacted African Americans,” said state Assemblymember Tony Thurmond at the meeting. About 25 residents gathered before the meeting, holding signs with variations of “Black Lives Matter,” a phrase used throughout the protests in December against the decisions to not indict the police officers involved in the deaths of Michael Brown and Eric Garner, both unarmed black men. 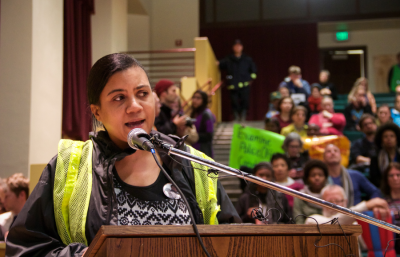 As many as 180 people were present at the meeting, several of whom voiced their concerns about the use of tear gas on demonstrators in Berkeley last month and spoke about experiences of what they considered racial profiling by Berkeley police. Maria Moore, sister of Kayla Moore — a transgender black woman with a history of mental illness who died in police custody in 2013 — discussed the importance of mental health care and said Berkeley’s mental health crisis funding had been slashed. 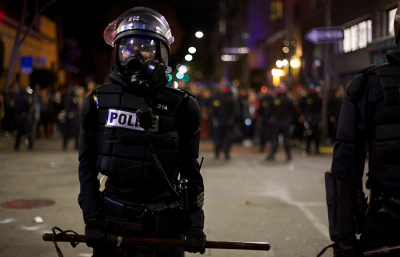 In response to the concerns raised, Councilmember Jesse Arreguin said he will be putting up several items for City Council to discuss at its next meeting, including authorizing the Police Review Commission to launch an independent investigation into police use of tear gas, rubber bullets and other crowd-control methods during the several nights of protests that began Dec. 6. Councilmember Susan Wengraf suggested developing programs that incentivize police to live in the communities they serve and building systems for better police accountability. A legislative panel composed of federal and state elected officials also talked about the importance of political reform at all levels of government. State Senator Loni Hancock spoke about new California bills regarding police body cameras and training protocol, and Rep. Barbara Lee discussed community policing as a way to reduce tension between police and civilians. At a council meeting in December, Mayor Tom Bates suggested scheduling Saturday’s meeting for January to allow UC Berkeley students — who formed a large portion of the demonstrators and who began winter break in December — to attend. But Matthew Lewis, the ASUC external affairs vice president’s director of local affairs, said many students were still out of town because classes do not start until Tuesday. 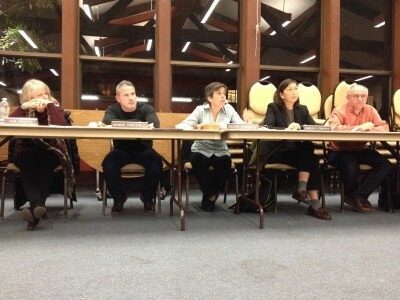 Though Berkeley Police Department Chief Michael Meehan attended the meeting in plainclothes, some attendees said they were concerned about the lack of police presence and involvement in the discussion. Meehan said he regularly meets with community members. Meehan said that managing the conflicting interests of keeping officers and demonstrators safe while allowing those who are peaceful to demonstrate is “complicated and challenging” but that BPD is looking for alternative approaches. He added that a comprehensive review of events during the December demonstrations is ongoing and will be released to the public once finished. Additionally, the city’s Peace and Justice Commission has passed a list of recommendations on policing and racial justice — including a ban on tear gas and military weaponry — that will be discussed at the next council meeting.